Starting with the industrial sector, the €26m phase 2 extension of Alexion Pharma’s manufacturing facility in Blanchardstown has recently commenced. Work is also underway on an €8.5m food facility extension in Naas, Co. Kildare for O’Brien Fine Foods Limited. Looking to the civil sector, tenders for the demolition and enabling works will be sought from contractors in December 2015 for the proposed new €22m Limerick Prison scheme. In Galway, a main contractor has been appointed for the €5.1m Kinvara Waste Water Treatment Plant with work expected to commence in early 2016. Also in Galway, construction work has now commenced on the new €25m Garda Headquarter Building. In the education sector, works have commenced on a €7m school extension in Loughrea, Co. Galway and a €3m primary school in Rathangan, Co. Kildare. Also in Kildare, tenders have recently been returned from contractors for the construction of a €29m Education Campus at Maynooth Universitythansk hun . Starting down in Munster in the medical sector, work has started on a €3m Radiology Unit extension in Clonmel, Co. Tipperary and a €2.5m extension has also commenced at Bantry General Hospital in Co. Cork. Back up in Dublin, tenders have recently been issued to a pre-selected list of main contractors for the new €6m National Ambulance Base in Drimnagh. Over to the residential sector, a 128 unit apartment development has started on a site north of Poppintree industrial estate near Ballymun. Over in Killinardin in south Dublin, work has commenced on a €35m residential development consisting of 72 units. Work on this development is expected to be carried out on a phased basis. Work started in early November on phase 1 of the residential element of the €200m harbour development in Greystones. The first phase should be finished by the end of 2015 with the second phase to commence in early 2016. The hospitality sector saw plans lodged for a new hotel at Sackville place in Dublin in early November. An Bord Pleanála has also overturned a refusal of permission by Dublin City Council for a €12m Hotel near Christchurch. In the commercial sector, enabling works have commenced to facilitate one of the largest schemes planned in the country; the €110m Capital Dock scheme on Sir John Rogerson’s Quay. 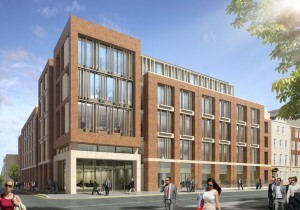 In Dublin city centre, demolition works have also commenced to allow for the construction of the €35m office development at 13-17 Dawson Street, the €30m redevelopment of the former passport office on Molesworth Street and the ambitious €150m Bolands Quay development. Following a successful demolition process, construction work is now underway on the €19m redevelopment of Kestrel House in Dublin 2. Down in Cork, it is envisaged that works will commence before year end on the €53m Event and Convention Centre in the Brewery Quarter area of the city. Plans have recently been lodged for a €37m office development in the South County Business Park in Leopardstown. Plans are expected to be lodged for the primary element of ‘Project Cherry’ before the end of 2015. This will see planning applications relating to access roads and green elements which will help facilitate the €2.5bn scheme in South Dublin. Focusing on the sports sector, a main contractor has been officially appointed for the €67m redevelopment of Pairc Ui Chaoimh in Cork and the tender process has commenced for the €8m Badminton and Velodrome scheme at the National Sports Campus in Abbotstown. To read more details on these and thousands of other fully researched construction projects across All Ireland, visit our website and take a Free 7 Day Trial to experience how CIS can enhance your business pipeline.